Seath the Scaleless is a Boss in Dark Souls Remastered. 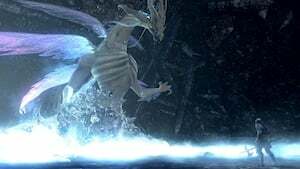 Envy and bitterness; words used to describe Seath's betrayal of his own kind; for unlike his brethren, Seath was born without the stone scales of the Everlasting Dragons. 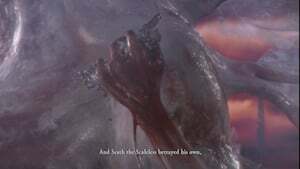 But with the help of Gravelord Nito and the Witch of Izalith, and Gwyn, the Lord of Cinder, Seath brought his own race to the brink of extinction, with many believing him to be the last of his kind. As reward for his service, Gwyn anointed Seath the title of "Duke" and gave him permission to build a grand archive where he could continue his research into his long held desire for immortality. This archive would come to be known as "The Duke's Archives". Along with these gifts, Gwyn also bestowed a shard of his Lord Soul upon him. After much research, Seath finally achieved his goal of immortality through the discovery of the Primordial Crystal. However, the discovery did not come without a price. As the albino dragon delved deeper and deeper into his research, his mind began to fade, and by the time he had achieved his goals, he had descended into madness. Becoming more and more paranoid, Seath locked himself away in the archives, fearing the other lords would attempt to steal his immortality for themselves. Barricaded within the archives, he sent his Channeler servants far and wide across the land to kidnap fair maidens and the undead for his experiments. 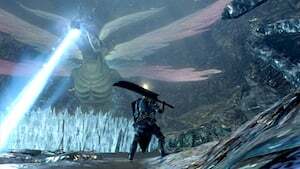 Moonlight Greatsword: Attacking the tip of Seath's larger rear tail (not the smaller side ones) will eventually cut it off, giving the host the sword automatically. Players must attack the tip of the tail and not the base. Seath breathes a white mist in a circular arc, directly in front of him. This mist triggers a mass of crystals to protrude from the floor, wherever the mist touched. This can be dangerous as the initial breath deals magic damage of its own, while the follow up crystals build up your curse - this is the case for any crystals that he raises from the ground. A telltale sign that this is about to happen is his head drops slightly, to his left. This is an imminent sign of the cursed crystal breath attack, so roll backwards to avoid any form of damage. The second variation of this attack is the same, but with a larger radius. However, due to the range of it, the sign that it is imminent is clear and takes a bit longer. Seath throws his head back for a second, then sweeps his head from side to side. When you see his head swing up, bolt it, or get behind him. The final variation on this attack is instead of throwing his head completely back, Seath winds it while still facing forward - think of it as preparing to header a ball in soccer - and blows a straight line of white mist. He starts directly below him, and follows through, for quite a large distance. When you see this, just run to the sides. Arguably his most deadly move, when you see Seath curl up, run for the hills. 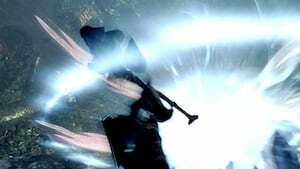 Create as much distance as you can from the white mist that forms around him, as he's about to let out a great explosion directly in front of him. This explosion is then quickly followed up with a mass protrusion of crystals in the white mist area. This attack deals a combination of physical and magic damage, and cannot be blocked. If you stay around his tails too long, Seath won't stand for it. Instead, he raises his largest tail - which should be the telltale sign for a tail attack - and slam down with all three of his tails all around the area. He can do this a few times, and getting caught will result in your death as it can stunlock the player. Seeing as you probably are trying to get the Moonlight Greatsword, you should see the sign, and since you need to attack the tip of the tail to do so, you can easily get out of range of this attack by rolling back. Alternatively, he has a second variation on this attack in which after lifting his tail, he still slams it down but only to begin sweeping with all three tails. This is arguably harder to get out of the way of, as the tails are always grounded. Use the same preventative measures as with the other variation. He's had it with you, Seath ain't taking your smack anymore. He raises either hand, and lays down an open-palm smack, dealing seriously physical damage. When the hand is coming down, roll in the direction it's coming from (left or right) while moving away from Seath. The cutscene only triggers when the host player moves into the area. If you have summons with you, give them time to run forward and position themselves near the crystal before you enter the room. Once Seath enters for the first time, he will block off the entrance, leaving you and your summons closer to the crystal. Meet Seath for the first time after taking the second elevator in the Archives and continuing up an increasingly-crystalized corridor, that ultimately leads up to Seath's fog gate. This is where your 0 deaths attempt comes to an end, as to progress, Seath needs to kill the player. Souls and Humanity will be lost upon death, unless a Ring of Sacrifice/Rare Ring of Sacrifice is worn - we highly recommend to equip one as this next section presents you a couple of challenges that may result in your death. Go gently into the night; delaying the inevitable will result in not only your death, but being cursed as well. So make it easy for Seath this time, so you can eventually return, and give him a proper fight. The player will respawn inside the Archives Tower after being defeated, locked up in a cell in the Archive Tower Prison. However, if you choose against equipping a Ring of Sacrifice/Rare Ring of Sacrifice and managed to complete the Archive Tower Prison without dying, when you return for your second attempt at Seath, you will find your bloodstain in the boss room. Though he was never an immortal, Seath is nonetheless still a dragon, and as a consequence of that greatly susceptible to Lightning Damage. Seath is blind, as noted in the description of the Helm of the Channelers, as a consequence you can use Slumbering Dragoncrest Ring or the sorcery Hush to make yourself undetectable, but that will not stop him from responding aggressively to all of your attacks. After starting the battle, re-enter the room of the first encounter to find a Large Magic Ember and a valuable Soul. The room may contain a hostile, insane Big Hat Logan if you previously saved him from Sen's Fortress and then from the Duke's Archives. You must also have purchased all of his magic spells while he was in near the moving bookcase. After becoming hostile, Big Hat Logan will be naked aside from his hat (the rest of his gear may be obtained from a chest located in the room behind the moving bookcase, where you spoke to him before to purchase spells), suggesting he is attempting to mimic Seath's "scalelessness". The name "Seath" appeared before in Fromsoft's King's Field games. 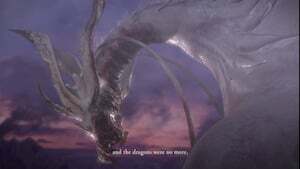 Seath has since known a number of either partial or complete reincarnations: Dear Freja (DS2), Oceiros (DS3), and Ebrietas (Bloodborne ) (read theory). Approach Seath directly from the front. Immediately after he begins his melee or vertical crystal breath, make a break for his tail. Seath's animation can be quite lengthy, giving you a short amount of time to get a hit or two in. Don't bite off more than you can chew. If you don't think you'll make the strike, or if he begins doing his AoE crystal storm, or if he raises his tail to slam down on you, back away immediately. For optimum maneuverability, lure Seath into the center of the chamber. If you have summoned someone, have them stand in front of Seath, distracting him (while they try to do a minimum of damage). This should keep him distracted long enough for you to cut off his tail. Remember step 5, though, and be careful if Seath starts getting ready to attack with his tail. This encounter allows you to enact your revenge on Seath, for the injustice of the first. To do this, you must venture through the Crystal Cave, and find him at the end of the area, past an abundance of invisible walkways, Man-Eater Shells, and Crystal Golems. 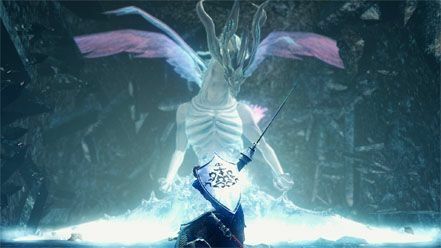 Unlike most other boss areas, Seath's area will lack a fog gate, the first time you enter from the Crystal Cave which allows the Man-Eater Shells to enter the area making it a tougher fight; however they can be damaged by Seath, and in the event that you do die, the next time you enter the area and every subsequent attempt, a fog gate will be present to block Man-Eater Shells from entering the boss' arena. Past the Man-Eater Shell area, you'll find another spacey area with a number of statues of cursed players standing in low, glowing mist. 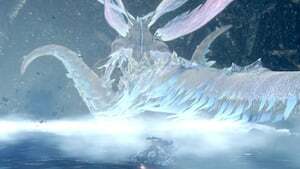 Make your way across the area to trigger the cinematic that will show Seath the Scaleless make his grand entrance, but not before emphasizing the crystal at the end of the room; this is the Primordial Crystal, his immortality. Destroy it, destroy his immortality. Alternately, if you are entering a second time, you'll be required to run around Seath to reach it, but don't be too worried as it will break on one hit. Unless you have already been defeated by Seath before, do not break the Primordial Crystal immediately. If he is entering for the first time, wait for him to move forward into the middle of the room, first. If you break it too early, he will spend most of the battle right at the area's entrance, and his tail will clip through the walls. This makes it extremely difficult to acquire the Moonlight Greatsword, and exposes you to much greater risk from his physical or breath attacks when trying to get behind him in close quarters. It is possible to kill Seath without destroying the crystal yourself. If you would like to add insult to injury, wait for Seath to reach you, then circle around to his tail. He'll most likely attempt an attack on you but will destroy his crystal, reversing his immortality and becoming momentarily stunned, which gives you a small window to get free hits on his tail. Numerous strategies will be effective against Seath, as he moves slowly and can be target locked from very far away. Ranged weapons, spells, pyromancies, and miracles are all effective, as are melee attacks on his appendages. During your first battle with Seath, it is recommended that you do not rush him, but instead observe him to get a sense of his attack patterns and vulnerabilities. The boss area is quite large and it is usually trivial to stay out of range of his breath attacks until you decide to commit. Specifically, staying off to either the left or right of Seath will allow the player to take him on quite easily. Just continue to hit his side tails until he lunges down to hit, then roll or block to get away and face his front. When Seath goes for a frontal attack, move to his side again and attack. Repeat these patterns until he is dead. Continually circle him while locked on and cast your best fast spells such as: Great Chaos Fireball, and Crystal Soul Spear. It is unlikely he will even hit you, If he does, continue to circle and Heal when behind or beside him. He is very susceptible to spells and pyromancies, and the ability to lock onto him from afar means such spells may be used quite safely. The Paladin Set, the Dingy Set, and the Antiquated Set, all have high resistance to curse build-up. Holding extra humanity can also greatly increase resistance, however it's up to you to weigh the pros and cons of using this in a high risk area like this. If you have low curse resistance, you may want to equip the Cursebite Ring before the battle. This will help slow the curse if you do happen to get stuck in his crystal field. If you get caught in it, roll out of it ASAP. Finally, if you become stuck in one of Seath's crystal fields, keep your shield up as you try to escape. This seems to reduce damage and possibly curse buildup, and you will see stamina drain as if you are continually blocking damage. how do I make a cosplay of this icy boi? The ring doesn&apos;t work, I wasn&apos;t touching him but still he kept spinning like a spin top. He stops when casting but not long enough to cut his tail before he spins again. So f****ing frustrating. How does Seath navigate his own archives if he can&apos;t fit through most of the doors? Also... Seriously... What&apos;s with the tentacles? Does being born without scales include also having octupus legs? Piece o&apos; cake. I ran in, hit the crystal and then ran up to his front left side and whaled on him with a +5 lightning longsword two handed until he dropped. Crest shield and cursebite ring kept most of the damage off when the curse crystals came up, but I just rolled through them back up to him, spammed estus a couple times, rinsed and repeated til he dropped. 1st try. SL87, Artorias set, Crest shield, +5 Lightning Longsword, Cursebite Ring and FAP ring. i have problem cutting his tail. seath goes close to die and the tail was still there! and all his/her health goes when I missed the tail so the weapon goes to his body! i think we have got wrong tail! maybe it&apos;s his foot or hand! and the tail is that big part stick body (like sheeps). Ugh,i almost died 5 times before cutting of his damn tail.Which I&apos;ve always wondered about, why is his lower body so deformed?In the cutscene at the beginning of the game u can see 2 of his tentacles moving about on the pile of dragon bodies. Btw idk whi made this but below 25% load even if I run as soon as Seath start moving his head. By the time I circle him his attack is done and he turns around. Impossible as a solo sorcerer 4 souls spear/ more than half dead and tail still won&apos;t drop. Either get help or play easy mode warrior if you want this. Okay but I bring him to half health and his tail is still firmly attached. This is gettig *****ing ridiculous. What shield is that in the picture? The Primordial Crystal almost reminds me of a bonfire, but instead of resurrecting the Undead after defeat, it prevents Seath from ever taking damage in the first place. But a bonfire requires a fire keeper, so I wonder if those Pisacas guarding the giant cell where we find a fire keeper&apos;s soul are actually Seath&apos;s imitation fire keepers... The Pisacas are evidently all women, judging from the two sobbing in the corner of the giant cell, and more importantly, they are all completely blind, a primary rule toward becoming a fire keeper. Plus they have the chance to drop solid Humanity, which is absorbed by fire keepers when offered to the bonfire. Of course, killing all of them still doesn&apos;t deactivate the Primordial Crystal, so that kind of puts a hole in this idea, but I thought it was a cool theory anyway. Can&apos;t cut off Seath&apos;s tail. Multiple times I&apos;ve taken his life down to only a hit or two remaining on his HP, ONLY MAKING CONTACT WITH HIS TAIL, zero hits to his body, zero hits to his tendrils and his tail won&apos;t come off. I&apos;ve tried cutting at the base, the middle and at the tip to no avail. Rings: Cloranthy Ring & Cursebite Ring. Am I doing something wrong or is something I have equipped interfering? If I finish Siegmeyer of Catarina&apos;s quest-line before heading to the inner garden of The Duke&apos;s Archives, will the golden crystal golem in the center of the garden disappear? Stupidly easy boss. I just casually walked towards his right tentacle/tail thing, not locked on to him, and smashed it with Grant. He just kept rotating and doing his breath attack, which missed every time. Indidn&apos;t get hit once. This was by the easiest boss fight in the game so far for me. I just beat him 1st time on the second occurrence. Queelag Fury Sword +5 two handed and the Grass Crest shield (or anything that speeds up stamina regen) and a low equip load. I went straight for the crystal and destroyed it. Got close to him and stayed with on his right attacking his side tail. His crystal attacks should not hit you if you keep moving with the side tail in a counter clockwise movement. The journey to him was more tricky for me with the invisible platforms. Prism Stones or arrows help with those though. It seems like using the Slumbering Dragoncrest Ring has some INITIAL effect but after a minute or so, he was having none of my shenanigans.